“The Flavours of Asia” - People enjoyed free barbeque and free tasting of Filipino foods at the Grand Opening of Lyn’s Asian Variety Store at 2 Dalley St., East Lismore (02) 66218181. Owners: Gary Lyn Mazzer. The delightful Fusion Festival 2013. Celebrating cultural diversity is one way to show respect to other cultures in beautiful country Australia. It does wonders in the heart of individuals involved. The Southern Cross University is well-known for its openess in the lives of students who came from other countries. Catering for their needs through education and helping them adapt to their new environment have ease the feeling of home away from home. Australia is their second home. Happy feet, smiling faces - off to the yearly Fusion Festival celebration from 03-06 September at the Southern Cross University. The weather was kind to everyone. The smiling sun was up and bright. The celebration was free, open to students, staff and the community. Its aim is to further intercultural understanding and communal harmony through interaction in various forms - from cultural to social, intellectual and sporting events. Showcasing the different events everyday got the interested eyes and ears of the public. I think the most famous one was on the first day. There was the Isabella A Capella singers with their wonderful songs and great voices that have lifted up the spirit of everyone as we might all be aware that music is the language of the soul. The Chinese music and dance had captured the audience eyes with their colourful costumes. The greatest part of the celebration is the food from around the world which was served to everyone at 12:15 in the afternoon. It was a great lunch we all have. And it was FREE. 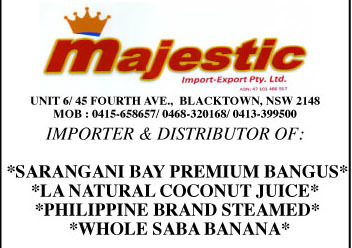 Foods from Australia, Philippines, Vietnam, Japan, Indonesia among others. There is nothing more we could ask for. A BIG THANK YOU to the Southern Cross University who provided the money and also to the Volunteer Cooks who did a wonderful job - Cooking. Everybody was satisfied. Southern Cross University is always generous. Let us count ourselves fortunate to have benefited such generousity. Looking forward to see you next year. Keep up the good work - Rachel, Kim, Cathy and the community who were involved in making the celebration a success.